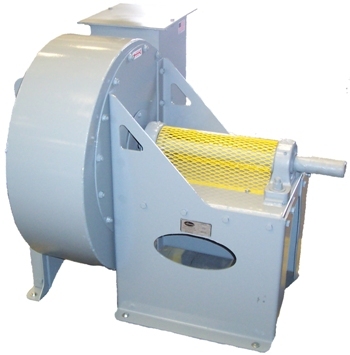 Aircon “P” series material handling fans fall under the general category of centrifugal fans. These types of fans pull in air axially into the center and force air outward in a direction tangential to the fan wheel (90 degrees from the inlet). By contrast, axial fans force air out axially 180 degrees away from the intake. Centrifugal fans include forwardly curved fans, backwardly inclined fans, radial fans, and radial tip fans. The radial fan is the design used by Aircon. While a radial fan may not produce the high mechanical efficiencies relative to other types of centrifugal fans, it does prove to the be the most durable material handling fan available. Radial fans are also capable of producing relatively high static pressures from medium to low air flow volumes. The impellers of all Aircon fans are constructed from 1/4″ to 1/2″ thick plate. The durability of these blades make these fans ideal for humid environments where an excessive amount of moisture often causes the conglomeration of wet wood chips or long strands of paper. The heavy duty construction of Aircon fan scrolls and housings make these units appropriate for most types of industrial environments.